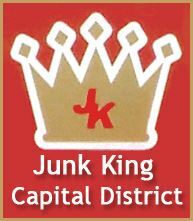 The best move you can make for total junk removal is to place a call to Junk King. This is the company that is part of a national chain of professional junk haulers. Want to know more? These FAQs can provide the answers. What kind of stuff can Junk King take away? The list of items Junk King can remove is a rather long one! Here is a sampling of the kinds of things Junk King has already hauled out of homes and businesses around Albany. Cardboard, books, newspapers, bikes, exercise equipment, pool tables, above ground swimming pools, hot tubs, rug, doors, windows, counter tops, tile, furnaces, hot water heaters, office furniture, TV’s, tables, chairs, beds, bureaus, box springs, mattresses, love seats, recliners, couches, desks, swing sets, slides, vinyl flooring, stoves, refrigerators, microwaves, dishwashers, washing machines, dryers, sinks, toilets, bathtubs… the list can go on but you get the idea. If you want to get rid of it, Junk King can take it off your hands. Is there anything you can’t haul away? When it comes to transporting hazardous materials, our hands are tied. State regulations prohibit us from taking things like gas, oil, paints, propane tanks and chemicals. What happens to all the junk collected by Junk King? There are three potential drop off sites for your junk: a certified landfill, a recycling center or a charity. Of those three options, Junk King is going to do its best to avoid the landfill. They want to help Albany get to “zero-waste.” That means repurposing everything that is thrown out. You don’t have to concern yourself with sorting through your goods or being charged extra. The Junk King crews will do the sorting and the costs for recycling are part of the total junk removal package. How much does Junk King charge? Junk King is only going to charge you a rate based on how much space your junk will occupy in the back of the Junk King truck. This is a flat fee without any extra charges. You’ll be presented with this estimate once the Junk King crews can actually see what you’re throwing out. Keep in mind, that if you ask Junk King for an actual estimate, you’re under no obligation to use our services. We’re confident that you’re going to love our low prices. Your total junk removal is just a phone call way. Reach out to Junk King today to get the job done! This entry was posted in Junk Removal FAQs In Albany New York and tagged Junk King, junk removal, Junk Removal FAQs on August 29, 2014 by Todd Porter. Last updated August 1, 2017 . If this the fall that your kid is college bound? It’s an exciting time for the whole family. As the bags and books are getting packed, it might be helpful to get your kid ready by making sure they can stand on their own. We’re talking about the basics but basics that will become a part of their daily routine as they are miles from home. 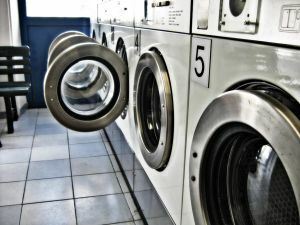 Top of the list would be to make sure they know how to do their own laundry. This is a great lesson to teach because they can be “practicing” for the rest of the summer. You just have to load them up with a roll of quarters and they’ll be good to go. Hopefully by now, your college kid knows their way around an ATM but it helps to have a refresher course in banking and budgeting. Plus, if you’ve been in charge of shuttling your kid around for the last 18 years, then they might need to familiarize themselves with public transportation. It will also help if they know how to cook a few basic items beyond the microwave. After you’ve made sure your kid is set up in their dorm room, you have the opportunity for a little college clean out of your own. You don’t have to convert their bedroom into your new arts and craft corner (yet!) but this is a great opportunity to get rid of lots of accumulated junk. Before the kid takes off, go over what’s left behind and what they want to keep. Everything else that they’ve outgrown can be carted away by Junk King. These are the junk removal pros who know how to tackle a clean out from start to finish. Whether it is taking care of a foreclosure or flooded basement, you can depend on Junk King to provide fast and reliable service. Junk King will be sending over a two-man crew who will do all the removal work. If you’ve got a pile of junk in your kid’s room, leave it right there. The Junk King crew will take it from that spot. While they’re at it, they can also remove all the junk from your basement, attic or garage that has been taking up valuable space. Hiring Junk King for your college kid clean out could be the beginning of a junk free home. This entry was posted in Albany Clean Out and tagged clean out, Junk King, junk removal on August 19, 2014 by Todd Porter. Last updated August 1, 2017 .